With 20,000 book volumes, periodical and newspaper articles, and archival materials, the collection proves a valuable resource center for research in areas in philosophy and religion, but inevitably crosses disciplines in all areas of study. The Library welcomes all learners and encourages both scholars and students alike to utilize our collection. To get to the Kierkegaard Library, go to the main entrance of Rolvaag Library, look to your right, go down the stairs, take a left, and we are at the end of the hall. 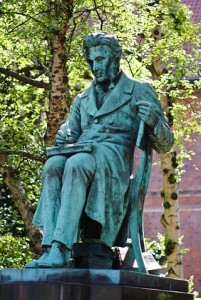 The Library’s collection serves students, scholars and anyone interested in the writings of Søren Kierkegaard, the 19th-century Danish philosopher. The Hong Kierkegaard Library is proud of its commitment to hosting and promoting international scholarship. The Library hosts anywhere from 45–70 scholars, both international and national, each year. While the majority of the scholars come in June and July, some choose to research in the Library throughout the year. As the scholars come from places all over the world, we encourage St. Olaf faculty and staff to spend time with our visitors. Whether it be of a professional nature, or simply taking them to a Twins game, the interaction will prove to be most rewarding. The Kierkegaard House Foundation Fellows study either as pre-doctorate or post-doctorate scholars and typically spend an entire year on-campus studying, writing, and publishing materials. The Summer Fellows spend the months of June, July, and August at the Hong Kierkegaard Library. These scholars reside in on-campus housing and come from all around the world and a wide range of backgrounds. For specific information or to schedule a time to meet, please contact Eileen Shimota at shimota@stolaf.edu. In addition to the books and other materials housed by the Hong Kierkegaard Library, online resources can be found below. There are. . . Dozens of organizations dedicated to unraveling Kierkegaard's existentialism. . . Hundreds of publishers of Kierkegaard text and studies. . .
Thousands of Danish websites with useful resources. . . Millions of informational websites online. . .
And countless booksellers with an interest in Kierkegaard.